Posted By:Unknown | At:2:19 PM Be the first to comment! WASHINGTON (AP) — Segregation is making a comeback in U.S. schools. Progress toward integrated classrooms has largely been rolled back since the Supreme Court issued its landmark Brown v. Topeka Board of Education decision 60 years ago, according to a report released Thursday by the Civil Rights Project at UCLA. Blacks are now seeing more school segregation than they have in decades, and more than half of Latino students are now attending schools that are majority Latino. In New York, California and Texas, more than half of Latino students are enrolled in schools that are 90 percent minority or more, the report found. In New York, Illinois, Maryland and Michigan, more than half of black students attend schools where 90 percent or more are minority. Project co-director Gary Orfield, author of the "Brown at 60" report, said the changes are troubling because they show some minority students receive poorer educations than white students and Asian students, who tend to be in middle-class schools. The report urged, among other things, deeper research into housing segregation, which is a "fundamental cause of separate-and-unequal schooling." Although segregation is more prevalent in central cities of the largest metropolitan areas, it's also in the suburbs. "Neighborhood schools, when we go back to them, as we have, produce middle-class schools for whites and Asians and segregated high-poverty schools for blacks and Latinos," Orfield said. Housing discrimination — stopping or discouraging minorities from moving to majority-white areas — also plays a role in school segregation and "that's been a harder nut to crack," said Sherrilyn Ifill, president of the NAACP Legal Defense Fund, which argued the Brown case in front of the Supreme Court. School performance can be entwined with poverty, too. "These are the schools that tend to have fewer resources, tend to have teachers with less experience, tend to have people who are teaching outside their area of specialty, and it also denies the opportunities, the contacts and the networking that occur when you're with people from different socio-economic backgrounds," said Dennis Parker, director of the American Civil Liberties Union Racial Justice Program. For students like Diamond McCullough, 17, a senior at Walter H. Dyett High School on Chicago's South Side, the disparities are real. Her school is made up almost entirely of African-American students. She said her school doesn't offer physical education classes or art, and Advanced Placement classes are only available online. McCullough noted the school is named after a famous musician, Walter H. Dyett, and the school no longer has a band class. "We don't have a music chorus class," she said. "We barely have the basic classes we need." Aquila Griffin, 18, said she transferred from Dyett to another high school 20 blocks away because she needed biology and world studies to graduate. The two traveled to Washington this week for a labor-sponsored rally outside the U.S. Supreme Court in support of public education. "Many blame the schools for failing, or teachers, but they never blame the bad policies put in place in schools," Griffin said. "A teacher can only teach to a certain extent with the resources. It's the policies put in place that's failing the students." 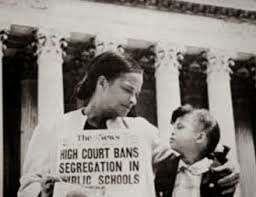 On May 17, 1954, the Supreme Court ruled: "In the field of public education, the doctrine of 'separate but equal' has no place. Separate educational facilities are inherently unequal." In the aftermath of that ruling, scores of cities and towns implemented desegregation plans that often included mandatory busing, in some cases triggering an exodus of whites to private schools or less diverse communities. John Rury, an education professor at the University of Kansas, said the work at UCLA has revealed how many of the advances in desegregating schools made after the Brown ruling have stopped — or been reversed. While racial discrimination has been a factor, other forces are in play, Rury said. Educated parents with the means to move have flocked to districts and schools with the best reputations for decades, said Rury, who has studied the phenomenon in the Kansas City region. In the South, many school districts encompass both a city and the surrounding area, he said. That has led to better-integrated schools. Still, around the country, only 23 percent of black students attended white-majority schools in 2011. That's the lowest number since 1968. Advocates point to rulings by federal courts that have freed many of the schools from Brown-related desegregation orders since the 1990s. That, they say, is leading the country back toward more segregated schools. At the same time, there's been a demographic change in public schools. Between 1968 and 2011, the number of Hispanic students in the public school system rose 495 percent, while the number of black students increased by 19 percent and the number of white students dropped 28 percent, according to the Education Department. Today, many Hispanic students are attending segregated schools, particularly in the West. Chuck Brothers, a retired social studies and psychology teacher who taught in a low-income school in St. Lucie County, Florida, said the nation trips over how to solve these issues. "I think we haven't taken the time, and it's across the board, politically and socially, to really understand what we really do want out of education and how are we really going to make it available for everyone," Brothers said.